Stella McCartney is a genius. Do you agree? 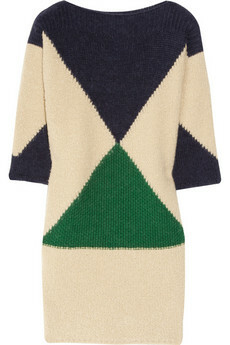 The cream, navy, and green color combination and the geometric shapes give this little number a retro chic feel. I'm in love. I love Stella McCartney! Many of her bags and shoes are animal friendly, too! This is gorgeous! It's like the baby of chevron and color blocking! You have great taste. I can't even put into words how wonderful this sweater is. I have a Stella McCartney sweater dress myself, and practically live in it!